Drawn from a lifetime’s experience of shared city-making from the bottom up, within rapidly expanding urban metabolisms in Delhi, Mumbai, Agra, Kathmandu, West Africa and London, Loose Fit City is about the ways in which city residents can learn through making to engage with the dynamic process of creating their own city. It looks at the nature and processes involved in loosely fitting together elements made by different people at different scales and times, with different intentions, into a civic entity which is greater than the sum of its parts. It shows how bottom-up learning through making can create a more vibrant and democratic city than the more flattened, top-down, centrally planned, factory made version. Loose Fit City provides a new take on the subject of architecture, defined as the study and practice of fitting together physical and cultural topography. 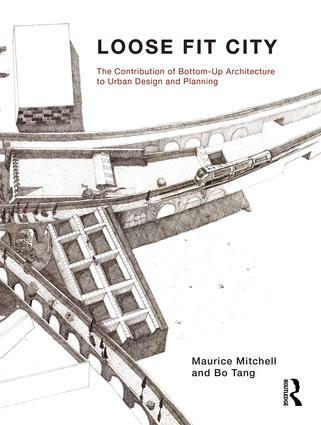 It provides a comprehensive view of how the fourth dimension of time fits loosely together with the three spatial dimensions at different scales within the human horizon, so as to layer meaning and depth within the places and metabolism of the city fabric. Maurice Mitchell, author of The Lemonade Stand and Learning from Delhi, practised in the slums of Ghana and Sudan, and as both architect and carpenter, upgraded the Victorian slums of south London. Since 2000, he has sought to unlock the huge physical and cultural reserve trapped within informal urban settlements in Kosovo, India, Sierra Leone and Nepal. Bo Tang, co-editor of Learning from Delhi and The Architecture of three Freetown Neighbourhoods, is a senior research fellow and lecturer in the Architecture of Rapid Change and Scarce Resources. Her research is focused on collaborative live projects and making as a catalyst for civic engagement and social change.